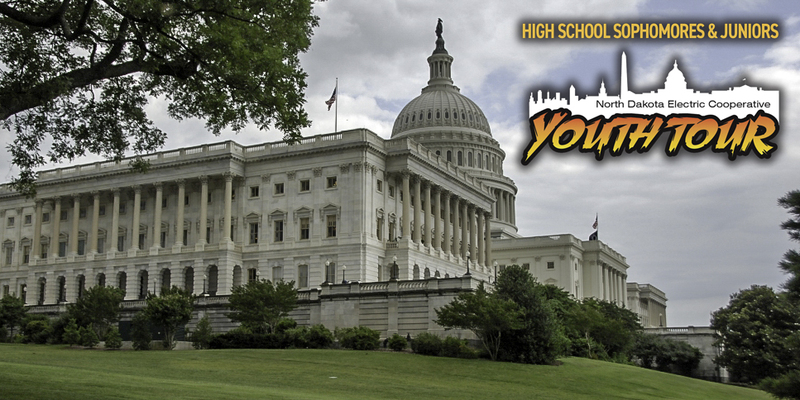 Every June, some 1,800 high school students from across the country spend a week in the nation's capital as part of the National Rural Electric Cooperative Youth Tour The students are sponsored by electric cooperatives that are committed to educating America's rural youth. Be enrolled as a high school sophomore or junior during the 2018-19 school year. You and your parents or guardian must be served by Roughrider Electric Cooperative. Essay is not to exceed two standard 8½- by 11-inch typewritten, double-spaced pages on this topic: Electric cooperatives are member-owned and controlled. As a future member-owner of your cooperative, describe ways that smart technologies and social media might be used to communicate with young adults. How might they be used to increase awareness and intersest in the many career opportunities with electric cooperatives? Submit your essay in hard copy or electronic format to Roughrider Electric. Electronic submissions should conform to the two-page, double-spaced guideline described above. Include a cover page with your name, date of birth, school and grade in 2018, parent or guardian’s name, address and telephone number. The deadline is Jan. 25, 2019. Emailed entries should be directed to bquenette@roughriderelectric.com, and hard-copy entries mailed to: Youth Tour Essay Contest, Roughrider Electric Cooperative, 800 Highway Dr., Hazen, ND 58545-4737.